Gather your girlfriends and head to Whistler for a week dedicated to girls who just wanna have fun! Whistler Women's week is usually held the first week in March (which includes International Women's Day) and features abundant activities for ladies-only. Visit Whistler during a time when lift lines are short but snow is still in large supply. Whistler accommodations are generally less expensive at this time too with all major holidays passed. Rent a big condo or chalet for the sleepover of a lifetime! 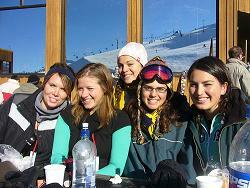 Leave the boys behind and make memories gliding down the slopes with those closest to your heart - your gals. Nightclubs and lounges are buzzing with special events and freebies for the ladies during Women's Week. Past nights-out have included rentals of "Greek Gods" to carry your handbags and buy your drinks. Each year brings more fun and creative ways of celebrating girl power. Great gear shops abound in Whistler! During Women's Week they host ladies' nights with plentiful perks. Score some killer deals on cute outfits and wicked skis and boards. Take your time and enjoy free appies and drinks while you browse. Local stylists are even known to drop in for complimentary beauty treatments. Women's Week is the only time in Whistler when ski and snowboard camps are offered for women-only. Whether you're just learning or perfecting your 360's in the terrain park - there's a camp for you. Focus is on encouragement and helping you improve your skills in a warm, positive atmosphere. Come with a bunch of friends or make them when you get there. Either way, you'll enjoy sharing memories, awesome aprés, and fantastic prizes at the end of the day. It's not just boys that can ride the rails. Check out the ladies tearing it up at rail jam contests. Pretty good park rider yourself? Sign-up and get in on the action, the cash prizes and a piece of glory! Find out more about great Whistler deals and discounts by signing up for the Whistler guest newsletter.